The Museum is an increasingly popular location for film and TV production companies working in Yorkshire. Our team have many years experience of working alongside production teams of all sizes, from small independent film makers all the way to international broadcast organisations such as the BBC. The Museum has featured in press conferences, live outside broadcast events, period dramas and daytime TV programmes, from “Shine on Harvey Moon” to “Flambards” to “Touch of Frost” and many more. There are many benefits in choosing the Museum as a film location, here are just some of the resources that film and TV production companies have used to their advantage. Our large Canadian Hangar can be configured in a variety of ways for production. BBC Question Time has been hosted inside the Hangar and our own memorial events take place here too. The roof beams can be configured and rigged for overhead lighting and remote head cameras, while the resident aircraft exhibits can be moved to provide a spectacular backdrop. Our Handley Page Halifax Friday the 13th is a very popular exhibit to provide an imposing backdrop and there is space for several hundred people to be seated in a variety of configurations. 3 phase mains power is available around the perimeter, in the floor and overhead. 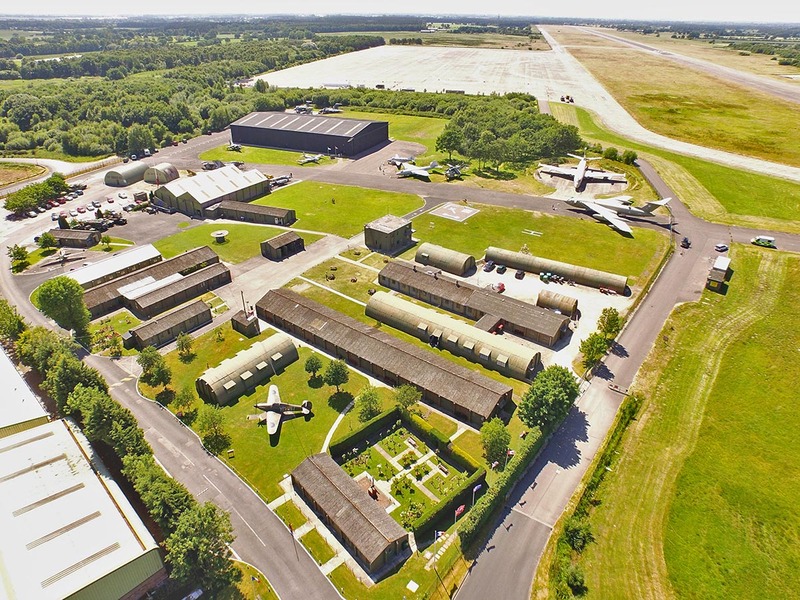 The Museum is located in the original grounds of RAF Elvington, a World War Two bomber aerodrome – the largest original station in UK. Most of the exhibits are original in authentic wartime buildings restored to their historic period when Elvington was a live air base. Our imposing Control Tower is the original building, the inside configured to show how it was used in live operations. Many of our aircraft exhibits are live and able to run their engines and systems as they did in period. Propellor driven aircraft such as our Douglas C47 Dakota, Devon, SE5a and Eastchurch Kitten are great subjects for filming, whilst our Cold War Jet Collection includes aircraft such as the Victor V-Bomber, Nimrod – Siper Spy Reconnaisance aircraft and Buccaneer fighter bomber – all in running condition, with many others having complete cockpits for filming. Our Collection of more that forty aircraft and a large array of period vehicles are frequently used for documentaries, period dramas and lifestyle TV programmes. The quite unique nature of the organisation at Elvington includes management and volunteers who have a wide combination of skills and qualifications that are probably not available in one location anywhere else. Our in-house Fire and Rescue team are certified to Civil Aviation Authority standards, equipped with huge Chubb Pathfinder rescue vehicles and the smaller 6-wheeled Range Rover based rapid intervention vehicle. Vehicle access for large location trucks can be arranged and the adjacent 440 acre Elvington airfield with 3000 metre runway accepts incoming flights by prior arrangement, with Jet A1 and Avgas available. With over 140 registered staff, we have a strong team with design, construction and electrical & mechanical skills who have many years experience in a wide range of disciplines. We are able to scene-set and bring resources to provide angles and height whilst being able to move these very large aircraft to suit filming and often work both behind the camera and sometimes in front of it to make your production a success. The ever present concern of keeping a film location team fed and watered has a simple solution with our NAAFI style restaurant. Hot food served each day with tea, coffee and other snacks always available solves the problem of feeding crew – they can even start and finish at unsociable hours to suit. 4G cellular data is generally strong throughout the Museum grounds, plus we have high speed wireless broadband at several locations throughout the Museum, perfect for live press conferences to allow media teams to file their stories. Our management team can work with you to co-ordinate all of these assets and services to help you create a successful production. From health and safety risk assessments to the logistics of having your presenters in live running aircraft, or even a live outside TV broadcast from the Museum are all elements we have successfully completed in the past. Many members of our team are confident in front of cameras and some of our staff are already familiar with some TV viewers as experts on the subject. We have a wealth of historical knowledge to convey to your viewers in interviews, with experience of presenting speeches at international events and appearing in TV dramas, films and documentaries.